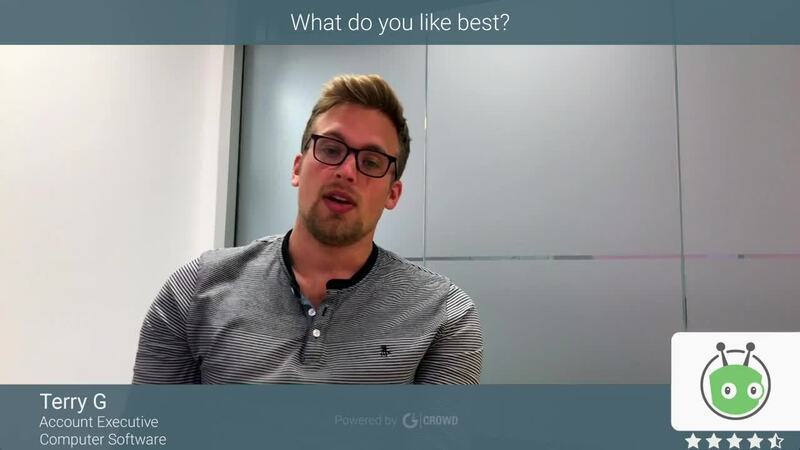 "Humanising Sales Like Never Before"
"Vidyard had changed the way I prospect"
"Best Platform for Creating and Sharing Personalized Videos"
The platform is extremely easy for our sales and marketing teams to create personalized videos to use as part of our outbound prospecting efforts. It required very little training to get everyone up-to-speed on how to use the platform. I also love the custom events that you can place throughout videos to encourage a specific action such as scheduling a meeting or downloading a piece of content. I wish there was a way to have more logic tied to the events in videos. It would be great if these could be tied to our Salesforce integration and automatically be determined based on specific account or contact fields. Right now, we have a default event and have to manually select the videos if we want to use another event instead. We're using Vidyard as part of our ABM strategy and it allows us to create personalized videos at scale. We've seen tremendous results in our prospecting efforts by including this as part of our approach. The reporting! Having the ability to know who is watching what videos and for how long is KEY is your content creation strategy as well as ABM tactics. We love that we can also work video consumption into our lead scoring process. I am always clamoring for more data — Vidyard has been great at listening to my wants/needs as a client and then molding their product development off of that feedback. Don't worry if you don't have a bunch of video content yet—regardless of whether you already have a library of content or are just starting, understanding how your content is being viewed, by whom, and where is KEY. START with Vidyard, and then worry about making the videos. By understanding what videos are being consumed, as a content marketer, I can now adjust my creation strategy to fit my audience's interest and needs. "Great tool for breaking through the noise"
Using the GoVideo tool helps personalize prospecting and sales cycles. For the greatest return make sure that there are shared videos that the team can use with the personalized ones. The tool allows teams to show concepts that can be shared with the buying committee either through screen recordings or whiteboard. There is not an easy way to provision users across the entire platform. It does mean users that are ramping can be prevented from using shared videos before they are trained. The tool is also only as effective as team buy in to the technology. Be sure to provide on going team level training for success. Be sure to ask about integration with your complete techstack and how it can be measured in your sales process. Another sales touch point for prospecting engagement. The reporting dashboard from Vidyard is great. I'm able to see more data than before, so we can really understand what is working and what isn't from a video perspective. The insights we get are really helpful in shaping our future video strategy. It's great to be able to see our YouTube and Vidyard analytics in one view as well, in addition to being able to easily share the content with our web teams. Nothing comes to mind. The platform is easy to use and the customer service teams are great. We wanted to have a centralized repository for all external video assets, which offered enhanced data and reporting capabilities. Now we are able to track and tie our video efforts back to demand generation, pipeline acceleration, and influence. Love the analytics that Vidyard is able to deliver, notably the attention span and the new Insights Dashboard takes it to a whole new level! Also love the ability to personalize videos too. There isn't a lot to dislike about Vidyard! If you're looking for a way to leverage your video assets and want to know what's working and what's not, no one delivers like Vidyard does. If you want to know how well your videos are being performing and engaging your viewers and customers, Vidyard is an outstanding choice! Vidyard enables us to host numerous video assets for playing on demand to our customers. Being able to pass the streaming of videos to Vidyard saves us bandwidth and a delivery of higher quality content. "Vidyard - taking video to the next level"
The personalized videos are awesome though we have yet to use them drive some more marketing leads.. We also like the sophistication of the different interactive elements that can be added to videos though we have not fully taken advantage of these yet either. The ease of embedding into other web properties including Youtube and social media. The ability to integrate with Marketing Automation tools (in our case Marketo) and your CRM (Salesforce). Really interested in taking advantaged of Viewedit for creating internal videos for our sales and tech support teams. Hosting and distributing our videos around the web. We are starting to gain insights into what videos work in our marketing efforts. Vidyard's team has coached us on how to better implement our video marketing strategy. "Scaling expertise across our Organization"
Vidyard's capability to organize related videos into playlists provides me an easy way to share key training and learning concepts with customers and colleagues. Vidyard's playlist and security features allows you to use the power of video in a secure, enterprise manner to help solve complex business challenges while delivering dynamic content. In addition to sharing learning and marketing content with customers and colleagues, Vidyard allows me to share excerpts of technical discovery conversations I have with customers with my extended team (i.e. Account Team, Product Experts) so they don't need to be present during the calls. This allows us to scale our expertise across our organization. The ease of use, the phenomenal onboarding and the results. often times with software you run into a compliance isssue internally - our users adopted Vidyard right out of the gates and continue to use it everyday. We really cant find a true dislike - but I think improvement in their analytics would be helpful. However, I know they are working on this. I would highly recommend Vidyard and would be available to chat with anyone considering using Vidyard. We incorporate Vidyard and personalized videos in a few areas of our business. Where we have seen tremendous results is its use in our new customer onboarding series & workflow. We have tripled our retention rate with new customers. "A Vidyard is worth a thousand videos"
My previous VHP wasn't very reliable. So I switched to Vidyard a couple of years ago. The system is easy to use, fast, and extremely reliable. The subtitles/translation functionality is robust, fast, and the translation costs are minimal. The Video Hub function allows me to have all my videos in one place on our site and still have videos embedded on the appropriate pages. When you look at all the factors, Vidyard is best in class. After being a customer for several years the only thing that I don't like is minimal. When you log in you have the option to display 6, 12, 18, 24 or 48 videos on one page. You have to set that view every time. I would like to set it once and then forget it and be able to change it when I need to. Maybe it is habit but when I log in, I like to review everything that we have going on with the videos and players. We are talking about 2 keystrokes here. So after a being a customer for a few years and not liking two keystrokes is microscopic. I haven't looked at another solution because Vidyard meets my needs as well as can be expected. There isn't anything that someone else can do better, faster, etc. So why would I look? I am very very satisfied with the service and the team that stands behind it. They rock. First, I no longer send my web guests to YouTube and lose them. I embed my videos on our web pages and so I am not sending my guests away from my site. Second, I can place events in the video so people can respond directly within the video rather than adding additional steps. That is HUGE. The subtitle function helps with ADA requirements, translations, and more. The problems solved? First I am not chasing web guests off of our site. Second we are making it easier to do business with us. Third we are expanding our reach with translations. The ability to send personalized videos of our product to our prospects and focus on key features. The outlook integration while using toutapp is really bad. Currently Vidyard doesn't work well when Toutapp is installed and the video bar crashes when trying to add a video into an email. If your are using Toutapp know that the Vidyard app doesn't work well with it. They are working on a solution and support is very helpful but currently can not use this tech to its full potential. Showcasing specific functions or features of our platform to prospects either before or after a demo. Helps to enable the contact to quickly show and build value with the rest of their team after our demo. Additionally, it can be helpful in generating interest for a prospect to see a demo. "Vidyard is the best! " Honestly, I can't think of much that I do not like about Vidyard! The only aspect I would add would be the ability to easily run a script that the viewer would not see next to your video while you are talking. Try new things in your videos and be creative! By using Vidyard, our emails are so much more personalized and tailored to the specific prospect we are reaching out to. This has contributed to a much higher email view, click and reply rate. I love how flexible the platform is. It's quick and easy to add in captions or overlays but you also have full access to the HTML/CSS so you can make it look exactly how you want. GoVideo is also excellent and has been a huge win for our BDRs. No major issues at all. I wish there was a bit more editing ability on the GoVideo side of things though. We host all of our marketing & product videos in Vidyard. The main benefit here is that we can create custom CTAs within the videos to help visitors continue their journey. For GoVideo, our BDRs use it to create personalized video for accounts that they are targeting. "Great tool for a great price"
The plug-in makes video recording and option selection very simple. The analytics around video usage is fantastic. This tool allows a person to person interaction within a SaaS business. It helps cut through the noise and provide even better service to our customers. Not only support response emails but also training videos to help new users onboard more successfully as they have multiple ways of consuming information. I get frustrated most with having start a video over because I cannot edit out a mistake. While this is on me, it would be nice if Vidyard added editing capabilities in the future. Our goals was to build more people to people relationships without always having the travel expense. Leveraging video for this but also for customer training and on-boarding has been huge. "One of the best vendors I've worked with...."
My favorite part about working with VidYard is the fact that they have the technology and expertise of a fortune 500 company, but the customer service and professionalism of a small business shop. If I have a problem (which is rare), they treat me like their #1 customer, and I know they have hundreds. They also don't up-charge you for anything. If they make improvements to the UI or UX, they make them and provide them to you. Not much. I know when features are coming out in advance and I want them to be out quicker. That's not their fault, its just a roadmap timeline is all. If you want the best technology, with the best service, they are the team. Truly a great company to work for. I don't think "no" is in their vocabulary. We now have a dedicated channel for our video/media plan. We are using it directly with our demand gen efforts and driving traffic, and more importantly leads, through our funnel and increasing our opportunities and revenue. The main benefit of having VidYard other than their video expertise and resources, is the fact that you have a channel dedicated to only your content. No more YouTube recommended videos with latest news videos or something like that. You know your viewers are going to only watch your content. "Awesome Platform to Increase Enagement across sales, marketing and customer communications"
The ability to amplify our brand and services across email, landing pages and social properties. Easy to use and get detailed reporting across engagement, conversions and campaigns we are running. The customer service team is great and the technical team has been there to address any of our needs. We utilize the real time watch data in our sales engagement campaigns which helps in our follow up cadence. The service seamlessly works with our Marketing Automation platform 366 Degrees. Vidyard platform and support has been top notch nothing at this point negative we have been customer a for two years. Take advantage of their quarterly customer review. They are very committed to not only helping you increase effectiveness of video but also how to better improve viewing results. The ability to effectively communicate our solutions across sales, marketing and customer support. We have seen increase in sales conversion, better campaign metrics and improved customer satisfaction through explainer and service related videos. "Pro video hosting that any digital marketer needs"
I enjoy the integrations, first and foremost. Hooking up videos data into Hubspot and being able to segment my audience based on real video engagement proven to be extremely valuable to multiple customers of mine. On top of that, I commend Vidyard support because they have your back for real. Make sure that you have your video strategy laid out before jumping to the tools. Having the cool tool like Vidyard doesn't make you Martin Scorsese overnight, you need to understand why you want to invest in the video (I bet you should do it, but make it a rational decision). Deep analytics of the videos engagement that we use in a sales pipeline, properly integrated with other tools in the marketing stack. It works. Plain and simple. The interface is clean and simple to navigate. The administration aspect is so straight forward it requires no esoteric understanding nor intense leaps of logic to complete tasks. My contacts within Vidyard have been transparent and open about the platform regarding road-maps and planned innovations. Of all the services that I find myself administrating, Vidyard as a whole is the most fire and forget solution, in the best possible way. The user base have adopted the product to such a degree that there is hardly an announcement or training session that goes by with some manner of host video within the platform. Not a real gripe only that occasionally I find myself needing to add a user to multiple (over 50+) groups within the platform. A bulk up-loader would be a godsend during this task, but overall not a deal breaker. Beyond that the recent update to the interface cause a small amount of groans from the community but almost immediately the new interface was adopted with gusto. Currently we utilize the service for video hosting/sharing internally with our user-base and externally with our customers. This includes both publicly and private sharing during 1 to 1 interactions. We hope this will make completing the task more efficient for you. "Analytics to turbocharge video marketing/lead scoring"
Vidyard gives us the analytics and lead capture tools we need in our marketing videos to properly lead score everyone we reach out to. The tracking you want to do on your emails, page-views, heatmaps, etc. just became accessible on your video marketing as well. It's a no brainer, why wouldn't you want granular data and insights on the marketing that takes the most time and money to produce? The marketing side of the product is great, embed CTAs in your videos, track that, see what performs well and what doesn't. The sales side helps you close deals, target leads, and get inside their heads when you can't actually see what they're doing. Using Vidyard for sales demos has helped all around, and using them for marketing material gives us insights that we wouldn't have gotten otherwise. Highly recommended. The newest product, Viewedit is also a super easy way to make videos. After being onboarded by Vidyard success reps our marketing team is quickly making personalized videos for our cold outreach and conversions are up. Their sales/pricing model is definitely enterprise. If you're a small fish without a ton of cash, give them a chat because they can be accommodating, but this is definitely NOT a freemium pricing model. Sign up for the trial and give it a whirl anyway. Try it! Should help lead gen and sales pretty much right off the bat, just make sure your videos are awesome, too. The onboarding team was great to work with and our marketing team has seen value. Videos used to be a black hole of data. Youtube doesn't give enough information, clean CTAs, or control over who views your video. With Vidyard I can tell who viewed a video, what they watched, etc. and it'll let me farm leads from that data. As well it'll let me know when leads are engaged with my videos, even after months of silence. It helps me market and sell better, and who doesn't want that? Also it plugs into hubspot. "Vidyard GoVideo. Bad for prospecting. Good for follow-up"
I like that I can record a video and send a link with GIF through outlook or gmail. This is no fault of Vidyard's, but video emails don't work well for prospecting because if you are not on a safe senders list, the video doesn't appear on the recipient's screen. At the start of the video, hold up a white board with the recipients name on it. So they know you took the time to make a personlized video for them. I am following up sales meetings with a video of myself summarizing the takeaways and next actions from our meeting. "Great tool for follow-up videos"
It's extremely easy to create videos that you can re-use for different prospects, send them as playlists, and see when people open them. This has been extremely helpful in enabling me to send effective follow-ups to people after our demos, or answer specific questions that they have. The support reps are also amazing! I wish they had a GIF option like CloudApp, but other than that -- it's great! I also wish that they had better reporting, it's quite confusing. Start with their GoVideo free extension. The paid version is helpful for playlists, but if you're hesitant -- the extension is great already! Shortening my sales cycle by sending videos to answer questions rather than trying to schedule a call. "Great way to engage with customers"
I like that this product makes it much easier to engage with customers. I notice that most of my emails get opened and links get clicked on when I use Vidyard. I like that it also plays other videos that get the customer to learn about our product. I've been able to close sales simply by following up on a video I sent. I wish it was a little easier to stop a recording. I have to lean in and look weird for about 2 seconds while I stop the video. I also wish it would record a 3-second gif and then begin the real recording so that way the animated thumbnail looks good and you don't look awkward while making the video thumbnail. It is an easy, yet effective way to get in contact with potential clients and customers. If you want to increase your open rate, use Vidyard! Our company sells an app that helps construction crews get live data and clock in and clock out. The problem we solve is getting rid of paper time cards and making the company more efficient. 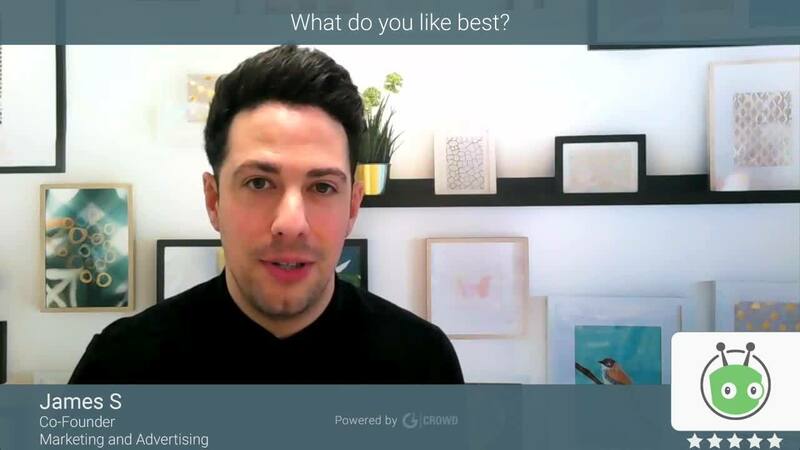 "Awesome video-hosting platform where you can gather granular analytics to make data-driven decisions"
I love the analytics on the platform. It's also incredibly easy to collaborate with the team. The groups/players relationship is a little clunky but that is going to change soon so I'm excited. It's secure, first and foremost. The analytics are amazing and the CSMs are there to help whenever you need it. It is a great platform to host video. Definitely analyzing the data. I am confident when I go speak to my bosses and tell them we should make a decision based on the analytics. "Great free Chrome Add on"
I love that this product is free in the add on version. Its very simple to use and helps a lot when trying to describe, document or recreate problems. I wish there was a simple editing feature for something like clipping the video to make it shorter. I would also like quick links to the difference between Player and Video - which has a great resource but I had to chat in to get it. Great as a convenience took for personal use. Easy, free and great support. Vidyard is a unique way to prospect to customers that gets their attention, and creates interest. The ability to create a video voicemail that gets embedded into your prospecting email is by far the best tool for prospecting that I have seen in years. I only wish I had more videos to host on Vidyard. Don't wait....if you are prospecting using email or cold calling only, you are missing this important tool in your arsenal. We are able to connect with prospects that would not normally reply to a cold email or a cold call. Now these prospects return our calls and emails, when before they would just delete our messages. very simple and easy email integration. I enjoy the idea and thought process behind Vidyard's capabilities. It's not that I dislike VidYard, I think they have done an extremely amazing job with their product and it's integration into other programs as well. My issue is more related to having my vidyard email attachments actually clicked and opened, which is very rare. Creating a face to face sort of marketing environment is always a challenge with outbound leads. VidYard aims to solve some of that concern and they do a good job with it. "Lots to love with Vidyard"
Vidyard is a a powerful solution that does quite a lot. It's used cross-functionally so in addition to marketing your AE's, SDR's, and Client Success folks will all see value from it. Originally I implemented Vidyard as a better way to get data from the video content we produce but the software helped me find new ways to utilize video with pages designed with Vidyards features in mind, and even handing video creation and curation to our sales teams. It's a small thing but I think the interface could be a bit easier to use. Also, some necessary features have been slow to be rolled out but they seem to be pushing them out more rapidly nowadays. Video is vital in our marketing and sales efforts and Vidyard gives us a powerful tool to manage those efforts. Without it we'd have to have a pile of other solutions to accomplish our goals that would be painful to manage, and frankly wouldn't do as much. I love being able to see what parts of a video resonate most with a viewer, it really helps me know which messages are sticking. We also really like the integration with Marketo to kick off automated campaigns based on the percentage of a video viewed. It's easy to set up and embed videos, and the different customization options really let us tailor our videos and CTAs. The one thing I have trouble with is the current dashboard layout. It can be a challenge to navigate to the right area easily. Other than that, we're very happy with Vidyard! We have found that our business is very visually oriented and we have some very dynamic speakers in our organization. Using video to let our prospects hear directly from us has been extremely helpful. "Great product for quality customer service"
This is a great product for any customer service job. It is very easy to set up, and it is easy to deploy on your chrome web browser. What it provides the user is to give a personal touch to their tutorial. I just made a video a few days ago to send out to clients explaining how to use a product that our company provides. This is much better than a written form or an explanation. The only issue I came across while using this, is that while you are recording, if you switch between windows or tabs the video will cut out. And first time users tend to be confused by this, thinking that their video might have also cut out the audio recording at the same time. Make the video transition between pages or tabs flow better. This product has greatly increased the personal touch when explaining a product. Because of this, we have seen great responses from the clients on how easy it was to learn what we were trying to teach them. "Best video marketing platform for business"
I first off like the interface of the entire product. It's very easy to navigate and simple to understand. The integrations with Marketo and Salesforce are very simple for the initial integration. I like how it also integrates with other video platforms such as YouTube, meaning I don't need to re-upload anything. It would be ideal to have an "instant chat" for the support, but they're extremely quick at responding to any major or minor questions. Most of the time I pick up the phone and chat with them directly or they call me back very quickly. Check out their blog and resource content... A lot of helpful stuff in there. "Great high-end video hosting platform"
If you are looking for an enterprise level video hosting platform with good integrations this is a great option. I love the seamless integration with Marketo and the UX is super easy and intuitive to use. The customer support team is great as well. It is an expensive platform so wouldnt make sense for companies that don't have a strong video strategy. But, if video receives its own budget and investment this would be a great option to consider. If you are looking for an enterprise level platform I think this is a great option to consider. The product and the team are great. We were able to generate leads through video and better score video engagement with the Marketo and Vidyard integration. We were also able to easily measure retention rate for our different videos and make revisions based on the data. "Great Solution for Video Content Management"
Vidyard is easy to use - the interface is user-friendly and it just works! When I first started using Vidyard, I was just uploading a few videos, creating players, and sharing out my finished products on the web. I have since learned how powerful the platform really is - I can add events, like capturing a viewer's email, restrict video viewing to my internal users, and run powerful analytics to see who is watching my videos and how what the retention is. With the Salesforce integration, we are able to bring this information into our system and match it with our contacts. I think the analytics interface is a little clunky and could use some UI improvements. I also would like to be able to clone an existing report instead of having to recreate it from scratch. We are able to see who is actually watching our videos and run analytics on them. This helps us determine how impactful our content is and when we should look at changing or enhancing our videos. "Easy to be creative and stand out"
I like how easy it is to quickly make a short video for a prospect and import it to an email. The SalesLoft integration is a lifesaver. I use vidyard everyday for making prospecting videos. The web app isn't the easiest to use. I wish there was an easier way to upload mobile videos too. It helps me stand out when reaching out to prospects. I can even showcase my own tool in my prospecting videos. Knowing when and how much of the video has been watched is incredibly helpful. When I know they watched a whole video I can make a phone call to secure the meeting a lot quicker. "Lots to love in a company that's only growing"
Vidyard provides some robust, actionable analytics that are unlike anything I've seen before in a video sharing platform. It's really great to see just how much people watch our videos-- and to what extent-- as well as how much engagement each of our videos actually receives on a case-by-case basis. The Marketo integration is not Vidyard's fault, but has been pretty complicated for our agency. I have heard that Vidyard recently did switch over to Marketo itself for its business needs, so I assume Marketo integration will only improve from here on out. The UI also can be slightly confusing at times, but it gets the job done when you get used to it. Specifically, I wish it auto-saved. We've only been with Vidyard two months, but we're already getting a greater understanding of how to title our videos, what splash screens would be best for optimal CTR, and what kind of copy to write around our video. In the future, we hope to figure out what viewers actually want to watch, i.e. on product demo videos, whether they'd like to watch any live-action parts, or get right to the action. "Vidyard is an excelet tool to reach people in a fresh manner"
I like Vidyard because it enables me to reach people in a refreshing and new way. My contacts are delighted to be reached in such a fresh manner and happy that somebody took the time to prepare a personalized video even though it is very easy and fast to do. I dislike the fact that it is not possible to attach documents in the video-email configuration I currently have installed in Salesforce. "Vidyard takes your video marketing strategy to the next level"
The ability to integrate video with our MAP/CRM system to turn viewers into leads and measure the impact of video on our pipeline and revenue is extremely powerful. The customer service and support we've received from Vidyard is also excellent (and I tend to be a very picky and demanding client). The platform isn't always as intuitive as I'd like and it doesn't make managing videos in bulk very easy. Vidyard is well suited for marketing teams for whom video is no longer just a "nice to have". When you need to measure everything and want to treat potential customers who watch videos just like you treat prospects who download eBooks or attend webinars (i.e., turn them into leads, score them and send them over to your sales team to follow up with), Vidyard is the way to go. If you're not interested in MAP/CRM integration or just need a lightweight video hosting solution, Vidyard may not be the most cost-effective option. With Vidyard, we've turned video from a "nice to have" to a key part of our marketing and pipeline generation strategy. Viewers can now become leads and we can track the impact of our videos -- which often require a huge investment of budget and time -- on our pipeline and revenue. "Vidyard Rolls out at Cushman & Wakefield"
Based on its ease of use for our non-technically minded folks, as well as it's robust analytics, Vidyard is being given a solid trial run as C&W's sole means of media hosting. It would be nice if the pop out windows did not offset the video window. Right now I have a pop out window on the left of my video that gets displayed at the end as a call to action. But adding this window throws off the center alignment of my video window. The video window should always be anchored in the center of the page. Our benefits have been most noted in terms of analytics. We have been very pleased with the easy user interface in terms of how data is displayed and conveyed to our staff for interpretation. The data collected has been very useful in helping us tailor our media to match the viewing habits of our audience. From my perspective, Vidyard is really the only B2B video content management platform that truly integrates into the demand generation process via marketing automation and CRM. As a product marketer, I really want detailed analytics into how my video assets are performing both in aggregate, but also how they are influencing actual contacts and ultimately revenue. By connecting through my Eloqua and salesforce.com instances, I can actually connect those dots practically in real-time. And because Vidyard has highly configurable calls to action that can be placed at various points in and around videos, they also become a great demand creation mechanism feeding new inbound leads directly into Eloqua. Lastly, because Vidyard can track engagement by individual leads, this provides great sales enablement insights when reps are preparing to make and outbound call or prioritizing their call list. Some elements of the user interface are beginning to feel a bit dated, largely because Vidyard was one of the first of its kind to the market. However they are constantly innovating and making updates to keep improving the UX. Vidyard provides benefits across content marketing, product marketing, demand gen, sales enablement, marketing ops, and sales ops. Creating a business case that appeals to all these teams can be extremely powerful when doing a video marketing platform selection. I need the ability to track more than just video views or completions, but actually see engagement metrics in aggregate to help me fine-tune my video content and length. Given that a single video could cost tens of thousands of dollars, any insights I can get to help me course-correct or improve my engagement metrics in future engagements is highly valuable. I also need to be able to better tie my video content to actual revenue attribution. The days of creating a video and just tracking views are over - the business needs to know what return we're getting on our video investments. "Real technology that proves the value of content marketing"
I really enjoy the analytics and reporting capability of Vidyard. Not only am I able to see the views but I'm able to see true engagement data of my videos. With its integration to marketing automation, I can see which prospects and customers are viewing which videos and how far in the videos they are getting. It's a great way to justify the investment in video and tie back video's impact into our overall marketing strategy. They just released a new personalization capability which I am really excited to try as well. Historically, any time we have used personalization in emails there has been a lift in click throughs and conversion so I can imagine videos would be that much more impactful if personalized. I can't think of anything I would change at the moment. The tool is incredibly easy to use if you are familiar with platforms like Vimeo or YouTube. We were looking for a professional video hosting tool to help us brand and customize our video player, along with something that provided better analytics than what is standard in free services like YouTube and Vimeo. With Vidyard, we can integrate directly with our marketing automation tool so we know who is exactly viewing our video content. We can then attribute that content as part of the overall influence in a deal. "Vidyard opens up doors to conversations"
In a world full of automation and robots Vidyard allows me to reach out to prospects on a human level. Being able to personalize the message specific to there company opens up the door to far more conversations than traditional email. I don't like to use Vidyard for every sales outreach because quite honestly it takes a little time to get the perfect video. However this is a great way to break through a target account that has gone dark. I am breaking through target accounts and starting a sales conversation or process. The main benefit I see is the "human touch" that allows people to see I am not a robot and I have spent time to research there companies. "Vidyard is an intuitive video platform." Video should be a part of your content strategy. I think most people have a pretty good handle on that by now. More importantly, you aren't really using video fully if you can't track actual engagement. Vidyard has allowed us to score leads on video engagement and see how it performs. 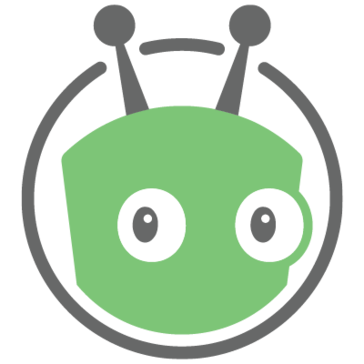 We had some difficulties setting up our integration, but Vidyard was awesome about helping us get it figured out and has a great dedicated support team. Devote time and effort to correctly installing the product, and then using the data to make actionable marketing insights. Vidyard isn't valuable as just a video hosting tool - it's the engagement data that you need to make part of your strategy. Tracking video engagement through to lead scoring was my primary responsibility within Vidyard. "Excellent entry point into video for sales development and overall Account Based Marketing and Sales"
Convenience and options to integrate video within current marketing and sales efforts. Ability to personalize shareable content at scale. Ability to humanize the impersonal world of SaaS remote sales. Set clear, defined, concise SLA's for the use of the software. User adoption is perhaps the biggest downfall for a lot of new technology and Video is no different. Humanization of mass outreach for sales and marketing. Ease of introduction of a new outreach method in an otherwise unchanging world of sales and marketing. I like having the ability to record high quality videos quickly and being able to copy and paste into an email with ease. I like how easy Vidyard is to use, very simply to record a video and edit. Nothing I dislike about Vidyard. It allows me to prepare personalized videos to prospects which helps me stand out from the rest of the noise. If prospecting, keep videos concise and to the point. Ability to record and send video to whoever you like. The benefits are I'm allowed to stand out from other reps by sending personalized messaging that helps me demonstrate my personality that email and phone calls can't provide as much. The video tracking and light metrics help us to see how well a video is doing, and on top of that how well each section of the video is doing. We can then take that learning and apply to future videos during the creative stage. The analytics could go a bit deeper, and the user interface is a bit clumsy. We are solving lead generation issues, and able to track and move leads forward via the video channel, where previously the success of the channel and movement of leads was more inferred than factual. "Experience as a Content Manager using Vidyard"
I like the fact that it stores so many videos and it streamlines my ability to manage all of the content. The vidyard team is very responsive and great to work with. Whenever we provide feedback they are quick to offer a solve. Sometimes the playlists don't sync correctly and there could be an easier way to fix that or get alerted when something isn't connecting to YouTube correctly. I wish there were a better way to track analytics in vidyard without exporting spreadsheets. It would also be great to get captions for all videos on the platform. Would love to be able to get to build an internal video hub in Vidyard to share the latest videos with my colleagues. It would be good if Vidyard tailored best practices content to our specific needs/company. Hire or train someone to be a Vidyard consultant to teach people how to make use of the platform because there are so many amazing features and opportunities to make your business succeed. I love the CTA features, the ability to get the video download links to share with my colleagues, the playlist features for quick uploads, the quick uploader widget, there are so may benefits to using vidyard. My team and I use Vidyard to reach out to cold prospects. We are able to hyper-customize our messaging so that people know exactly why we're reaching out. What I like best is the ability to create many videos at a time and then send it out. Sometimes the UI is a bit clunky between the ViewedIt app and the Website. Vidyard is constantly improving on its software and providing additional changes based on user feedback. If you're looking for a tool that allow you to quickly reach out to top prospects and customize a message to them this is the right one. The problem that we're solving is standing out from the crowd. We've been able to get key meetings with senior leadership at Fortune 100 companies. We use them for hosting videos and our ability to send videos via the API so we can automate the process. "Great UI - Easy To Use"
The basic UI in this product is pretty great. I've never had a issue locating the video or analytic Im looking for when diving into the tool. Fantastic sharing options with an ability to re-download the original video in case you have misplaced your own hard copy of it. Really great. No complaints yet. I'm an occasional user of this product on my specific marketing team. Mostly using Vidyard to house the many webinars we record on a weekly basis, and track analytics in order to speak to the lead power of these webinars/videos. "Turn Viewers into Customers with Vidyard!" Ease of Use - Vidyard is extremely straight forward and user-centric. Uploading, organizing, and gathering insights into the performance of videos is easy peasy! Dedicated Customer Success Team - Cannot describe in words how lovely and helpful our CSM is. Extremely available and will work with you to understand your business, goals and help you implement a program that will help you succeed. Also tons of knowledge sharing about how other businesses are using Vidyard to help give ideas/strategies! Wish there was slightly more out-of-the-box functionality when it comes to building forms. The form builder is a little standard and does require code/someone technical to help if you want to customize these. Demand Generation + Leads - as a marketing team we are tasked with generating a certain amount of leads per quarter, as well as a percentage of total revenue. Because of this we need to be able to move prospects to Sales Qualified Leads within a certain time frame and we do that with engaging content. Video is more engaging and helps us move leads through the funnel faster. Creates Smarketing! Leveraging Vidyard and its Salesforce integration, means that our sales team can quickly and easily make videos to the leads they're talking to. They can also leverage our Vidyard library/sales player to quickly share videos with prospects to help with their sales cycles. * We monitor all Vidyard reviews to prevent fraudulent reviews and keep review quality high. We do not post reviews by company employees or direct competitors. Validated reviews require the user to submit a screenshot of the product containing their user ID, in order to verify a user is an actual user of the product. Hi there! Are you looking to implement a solution like Vidyard?